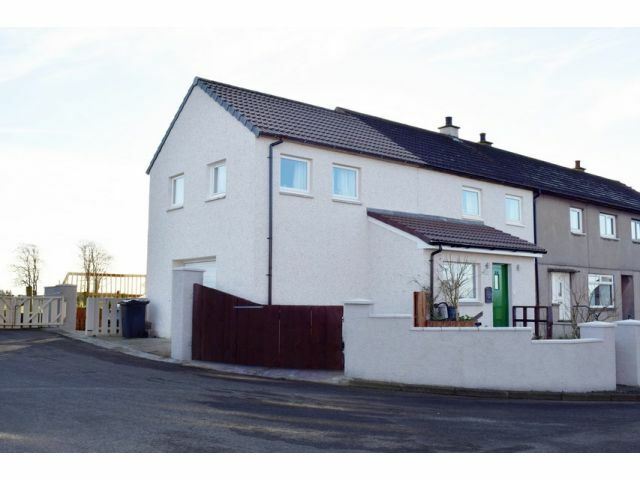 24 Ashyards Crescent is located in the centre of the popular village of Eaglesfield which has a primary school, village shop with post office and is ideally situated for access to the M74 North & South. Comprising of a useful Entrance Porch, Lounge, Kitchen and under stair Pantry. Upstairs there is a Master Bedroom with En Suite Shower Room, Walk in Wardrobe, Two Further Double Bedrooms, Bathroom and additional WC. Outside there is a garage forming part of the extension (which could be converted to a self contained annex), off road parking for two vehicles and enclosed front and rear gardens. Window into Porch. Coving, ceiling light. Under stair cupboard which has been converted to a useful pantry. Electric radiator, laminate tile flooring. Windows to front and rear. Coving, ceiling light, electric pebble effect fire with wooden surround and marble hearth. Two electric radiators, carpeted flooring. Window to rear with blinds. Coving, one x four spotlights. Range of wall and base units with under unit lighting. Electric cooker point and extractor fan. Deep white composite sink and drainer with mixer tap, plumbing for washing machine and dishwasher or drier. Splashback above sink and cooker. Space for fridge freezer. Electric radiator, laminate tile flooring. Loft access. Coving, two ceiling lights, two smoke alarms. Walk in dressing room / storage (2.20m x 1.60). Carpeted flooring. Two windows to front, two to side and one to rear. Loft access. Coving, ceiling light, TV point. Laminate tile flooring. Window to rear. Ceiling light, extractor fan. Partially tiled walls. Suite comprising of toilet, wash hand basin set into vanity unit and corner shower unit with electric shower. Wall mounted fan heater. Vinyl flooring. Two windows to front. Coving, ceiling light, useful storage / closet and shelved airing cupboard. Electric radiator, carpeted flooring. Window to rear. Ceiling light, extractor fan. Toilet and wash basin set into vanity unit. Vinyl flooring. Window to rear. Coving, ceiling light, carpeted flooring. Window to rear with blinds. One x four spotlights, extractor fan. Suite comprising of toilet, wash hand basin set into vanity unit and bath with over head electric shower. Fully tiled walls. Wall mounted mirror. Heated towel rail, vinyl flooring. Walled garden to front with decking leading up to front door. Water feature and mobile planters. To the side there is access to the garage (5m x 5m) and an off road parking section. The rear garden is low maintenance with chippings and mobile vegetable plots and planters. Outside tap, lighting and power points. Rotary clothes drier. Offers in the region of £130,000 are invited and should be submitted to lj Residential, 93 High Street, Annan, DG12 6DJ or by fax to: 01461 205037.